Moose and I got put on to Rod y Gab freshman year by a colombian buddy, and intermediately realized the realness of the pair...after missing one show freshman year, and regretting it up to the day we went to their show, we decided we had to go see them in LA...boy, it did not dissapoint....Playing in the famous Orpheum Theater, an old and spectacular theater with a somewhat hesitant crowd, we did our best to give back the energy that Rod y Gab were sending out. Playing jams from their two main albums, but concentrating on their new material, Rod and Gab put on a show for the ages. Although it's hard to believe, it really is just the two of them on stage. Rodrigo picks insane melodies while Gabriela manages to play the guitar while using it as a drum. The two had a completely bare stage, although a large screen behind them showed off their insane hand speed. 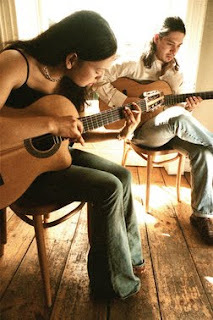 Both had unreal solos (check out gabriela's below), showing off the fact that they might be the two best guittarists in the world right now...Rodrigo even used a Heineken bottle (which now resides in our apartment) to make crazy sound effects with his guitar. After being escorted to our seats one time for trying to sneak to the front, there was nothing security could do to stop us doing the encore. We went straight to the front and started dancing with two other people. Rod and Gab saw us and came over while playing to show us some love, and Moose will be eternally jealous that I touched Gabriela's hand haha! I've added a couple links for some videos that I took on my camera and phone of the concert, and of Tamacun. As always, have posted a link where you can download the song. Enjoy.